There’s something to be said for the cars that no one sees coming. Big, bold, and ostentatious can have its place, of course, especially if flaunting how much you’ve spent is a goal. But if what you really want is something that’s modest, well-built by a respected brand, and yet has plenty of power and good bits tucked in underneath for when you really want to go for a rip? That’s a noble set of priorities. Landing something small that’s pushing 400 hp leans toward a delightful power-to-weight ratio no matter which way you turn, but to get this you’re inevitably looking to Europe. And when shopping in this class, there’s some chaos to overcome at the moment. The new Mercedes-Benz A-Class has AMG models coming, but they haven’t arrived yet. If you head out right now, you can get a 2019 Jaguar XE S that’s approaching the performance specs of the segment’s top competitors but doesn’t quite match them – and nothing close has been announced yet for the new generation that’s launching in 2020. That leaves two cars that currently rise to the top. The most recently updated model on offer is the hotly anticipated BMW M2 Competition. And then there’s the subject of this review, the Audi RS3. This car may be new to the United States having first landed for the 2018 model year, but the current iteration is far from new: this generation has been trucking along since 2013, having received a facelift just before it arrived. In fact, the fourth generation A3 on which this is based is expected to arrive sometime this year – likely first in the hatchback iteration sold in Europe with the sedan and performance iterations to follow. But in the meantime, don’t count this 2019 version out. Although there are a few ways in which it shows its age, the RS3 still has a lot going for it. The exterior isn’t really the best place to start when discussing this car because, frankly, it’s not very exciting. It’s no secret that Audi doesn’t often change much about its cars visually these days, and the brand has plenty of devotees who consider it a good thing. But on a car with this much street cred – although it does already have a unique front fascia, rear bumper, and diffuser treatments – some more visually obvious touches like more eye-catching tailpipes and special badging would be nice. That said, the Audi Sport light pools are pretty darned cool. Another way of looking at this is as a defense mechanism. If you get an RS3 in pretty much any color other than red, only the most in-the-know people are ever going to see it coming and have any idea what it is. Could this make the difference between having your Sunday drive spoiled and, quite literally, flying under the radar? We’re not endorsing any illegal behavior, of course – only presenting the point for consideration in case you were planning to engage anyway. Time for the good stuff. The RS3’s engine is Audi’s 2.5-liter turbocharged inline five-cylinder, which lands at 394 hp and 354 lb-ft of torque that’s fully available between 1,700 and 5,850 rpm. By contrast, the BMW M2 Competition has a 3.0-liter turbocharged inline six that makes 405 hp and 406 lb-ft of torque between 2,350 and 5,230 rpm. For reference, the 2019 Jaguar XE S doesn’t quite get there with its 3.0-liter supercharged V6 good for 380 hp and 332 lb-ft at 4,500 rpm. On paper, obviously, the M2 Competition has a clear advantage. (For my money, I think it sounds better, too, but that’s highly subjective.) That said, here’s one fact that you’ll want to have ready to fire off when you’re kicking tires in the coffee shop parking lot: in pure straight-line acceleration, the Audi beats it. The official figure has it taking 3.9 seconds to get from 0 to 60 mph, and some real-world tests have seen it perform even better. The M2 Competition’s official numbers, on the other hand, are 4.0 seconds with its seven-speed double-clutch automatic transmission equipped and 4.2 seconds with the six-speed manual. That brings up another important point: the RS3 doesn’t have a manual available. It comes with a seven-speed dual-clutch automatic only. What’s true to form about it, however, is that it likes to be driven hard. The shifts trip over themselves a little in more casual driving, but the harder you push, the more they smooth out and their assertiveness becomes a pleasure. It’s also worth pointing out that the RS3 comes with all-wheel drive as opposed to the M2 Competition’s rear-wheel drive. This will mean different things to different people. On the one hand, it makes for easier and more controlled year-round driving for those in areas with less-than-ideal weather. But on the other, loose is fast, right? Fuel isn’t typically of great concern in a purchase decision like this, but for what it’s worth, I can report that I showed an average of 22 mpg over a week, which is more or less in line with the EPA’s 19 mpg city, 28 highway, 22 combined estimate. On the inside, the RS3 has some elements that are very good and others that are not so great. The upside: the perforated and stitched Nappa leather seats are gorgeous and supportive – and they’re heated, which matters to northern buyers, though they’re not perfect since they’re manually adjusting. The optional carbon fiber accents are attractive, too. These finer details are at a level that suits the car very well. The fully digital instrument cluster is also very cool and sets out the right information in a way that people who want to drive this car the way it deserves will appreciate. The downside: some of the design elements are legacy Audi and are starting to look a little dated. The passenger side of the dashboard is pretty much just a wall of black. The sport steering wheel is suitably sporty-looking and has Alcantara inserts, a detail that’s not common these days, but it doesn’t come with a heating function, a fact that may annoy drivers who live in areas that get winters. The infotainment screen is the style that lifts out of a hidden storage compartment, and while it doesn’t take long to get going on start-up, that’s a system driven by one more thing that can break and that you’ll have no choice but to fix because you can’t really live without it. Its multiple input methods make it easy to use, though, and it does come with Android Auto, making it the only car in its segment that does, high-performance or otherwise. The M2 Competition and most others only have Apple CarPlay available. The RS3 is roughly the same in front leg room as the M2 Competition at 41.2 and 41.5 inches respectively. In rear leg room, the Audi has a slight advantage at 35.1 in versus the BMW’s 33.0 in – and, obviously, it has four doors, rendering the entire space more useful and accessible to those who plan to use it. The Mercedes-Benz A-Class has an official figure of 33.9 in, but the shape of the front row seats lends itself to providing a little more comfort, which for some buyers might be worth waiting on. If trunk space happens to be a factor that’s important to you, you’ll notice that the RS3’s seems relatively small, and that’s because it is. It measures up at 10.0 cu. ft. versus the M2 Competition’s 13.8 cu. ft. The shape of it is nice and square with no wheel wells to work around, and the 40-20-40 rear seat split with the VW Group characteristic ski passthrough is a nice addition. The A-Class Sedan has 8.6 cu. ft., so don’t wait around for it to come to the rescue here. It’s all kinds of fun, and it’s fast, and it gets better the harder you push it – all good markers in a car of this nature. Steering is razor sharp, as is handling, aided by the custom-tuned magnetic damping system, which is standard and adjusts its character rapidly between comfort, dynamic, and track modes, along with throttle response, steering, and shift patterns. Several cars that are larger and significantly more expensive have a comfort mode setting that comes across as smoother and less firm, but you get what you pay for. The only real complaint I come away with is that a fair bit more road noise makes it into the cabin than you’d find in similar but newer cars like the M2 Competition and the A-Class. Again, this just comes down to age. Sound deadening has come a long way since the RS3 was first designed, and the next-generation A3 will likely make significant gains here. The RS3 hasn’t had many reported problems to speak of. There was an NHTSA recall for repairs to the rear seat assembly in 2018, and some owners complain of a vibration in their sunroofs. There was a brief stop sale in Europe last summer to address the new Worldwide Harmonized Light Vehicles Test Procedure, but the RS3 ultimately came out of that unchanged and production resumed. 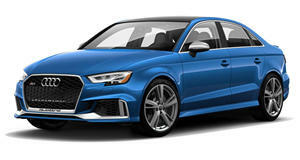 Pricing for the 2019 Audi RS3 starts at $56,200, which includes the sport seats, LED headlights with washers and dynamic taillights, the RS-tuned magnetic dampers (which can deleted and reverted to a spring setup as a no-cost option), 19-inch titanium wheels, stainless steel pedal caps, sport steering wheel with paddle shifters, panoramic sunroof, and Apple CarPlay and Android Auto, among other features. Several packages are available. The Dynamic Package ($1,450), which includes 19-inch Audi Sport titanium wheels, staggered 255/30 front and 235/35 rear performance tires – this is an interesting option that’s supposed to help loosen up the back end – red brake calipers, and a sport exhaust system with black tips. The Black Optic Package ($1,300) adds high-gloss black wheels and exterior mirror housings, black exterior trims, and a high-gloss black rear lip spoiler. The Driver Assistance Package ($1,500) includes adaptive cruise control, active lane assist, and automatic high beams. The Technology Package ($3,200) adds navigation and touch functionality on the infotainment interface dial, Audi virtual cockpit, and a Bang & Olufsen sound system, plus a six-month trial of Audi Prime and Plus.